I’m down to one cup of coffee a day. If you could see how quickly I am writing this you would understand why! With the length of time that I have been on Prednisone, that second cup of coffee can be the difference between 4 hours of sleep and 6-8 hours. To say that cup is important to me is an understatement! I decided if I only get one cup, I would use real cream, but the cream went bad before I could use it up. My prudent parent, from whom I inherited the frugal gene, suggested that I use Ready Whip, the aerosol cream. It lasts longer and looks pretty in the cup. But the Ready Whip tastes like coconut to me and I am not a fan of Coconut. Mom, on the other hand, likes it. In a perfect world, I would just get a Caribou coffee every day; but no one lives in a perfect world. My son works at Caribou and I pick his brain for ways to improve my lowly homemade cup. The problem is they have machines that use much hotter water and milk in their drinks. You just can’t duplicate it with a Mr. Coffee machine. Fill the cup with hot water and let it sit a moment or two to warm the cup. Wrap a coffee cozy around the cup, see http://wp.me/pKNzn-lD. Cover the cup with a saucer. All of these actions helped, but when I added the cream it cooled considerably. They suggested putting the milk into a small jar, shaking it for 30 seconds and zapping it in the microwave for 30 seconds. I did one better. I shake the milk in a small Tupperware container for 30 seconds, pour it into my coffee cup and heat both at the same time. I add coffee and sugar to the heated cup of milk and stir. It’s hot….or at least warm…to the last drop. The bonus is I no longer need to buy cream or creamers and my waist-line will benefit, too. 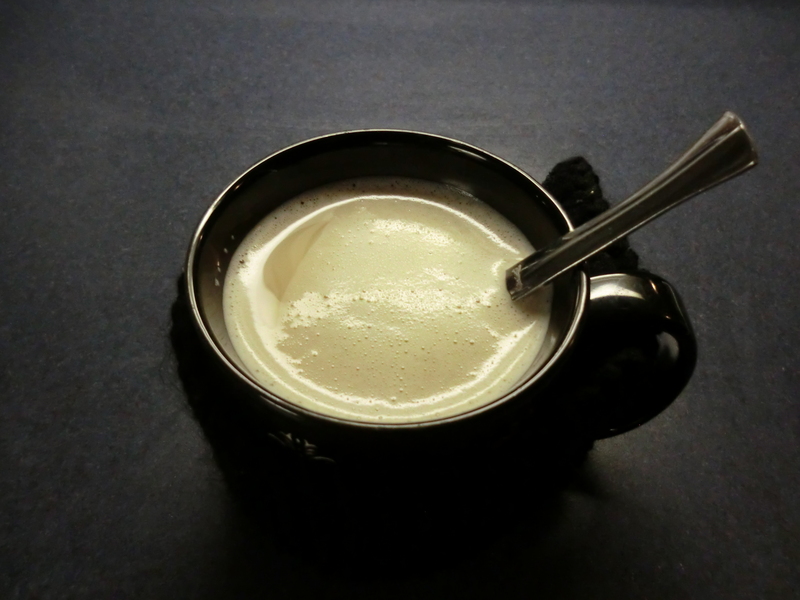 My coffee with frothed milk. This entry was posted in Food, Make It, Money Saving Ideas and tagged Food, Make It, Money Saving Ideas by Frugal Fish. Bookmark the permalink.